"It’s the first time an eight-speed auto has been offered in a large van, and is a feature increasingly in demand according to van operators." 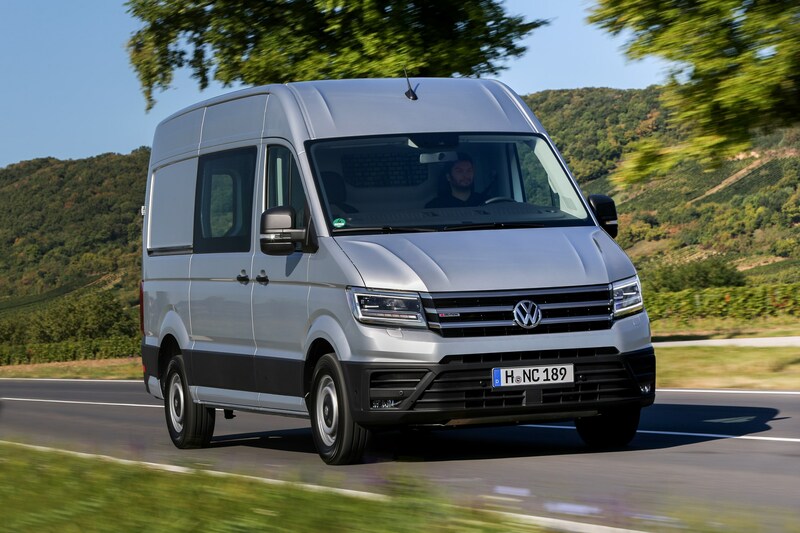 The Volkswagen Crafter has become more competitive for the 2018 model year, with the addition of new variants that boost its capability and broaden its appeal. 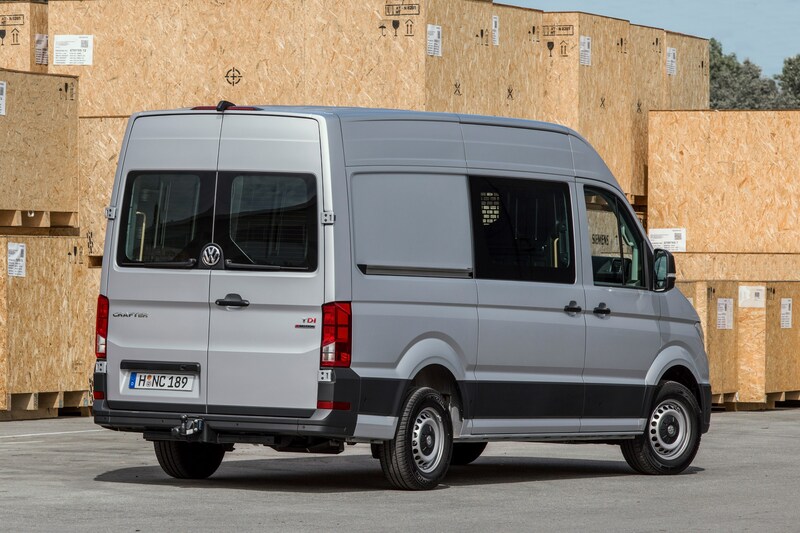 A year after the second-generation Crafter was introduced as a front-wheel drive van with gross vehicle weight (gvw) up to 3.5 tonnes and a manual transmission, it is now available with a choice of rear-wheel drive, four-wheel drive and with an auto transmission option. As a result of the new choices, the Crafter is now available with a gvw of up to 5.0 tonnes, and a 5.5-tonne version will follow next year. 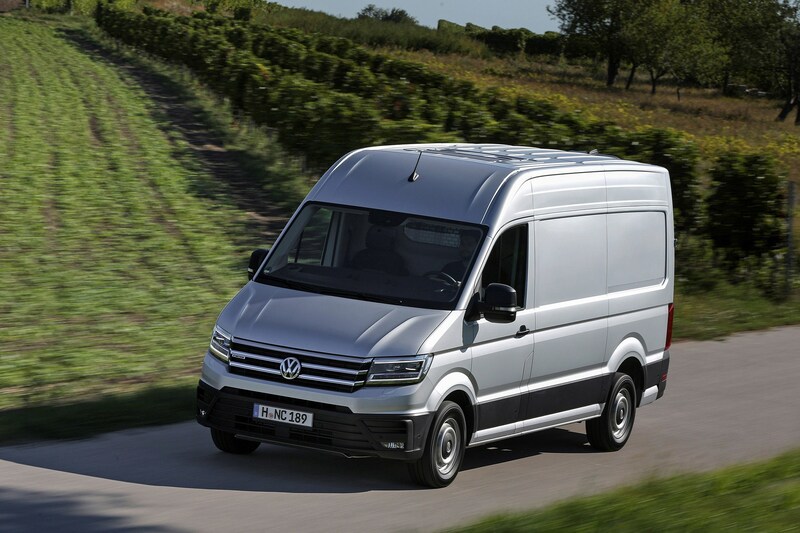 Volkswagen’s largest commercial vehicle can be configured as a panel van, minibus, single or double cab (pick-up, tipper or chassis) or box body. There is also a choice of two wheelbases (3.64m and 4.49m). The panel van is offered in three lengths (5.9m, 6.8m and 7.4m) and with three roof heights (2.3m, 2.6m and 2.8m). As a pick-up the Crafter is offered in 6.2m, 7.0m and 7.4m lengths, while the chassis cab is 5.9m, 6.8m and 7.2m. The Crafter with a box body has lengths of 6.3m and 7.1m. Standard roof is H2 (2.3m), with taller H3 and H4s. The engine line-up offers a choice of 2.0-litre units with diesel particulate filters and selective catalytic reduction, and an 18-litre AdBlue tank. Power outputs are 75kW (300Nm); 90kW (300Nm); 103kW (300Nm); and 130kW (410Nm), with the 90kW variant missing from the Crafter 30 and 35 models. The heavier duty Crafter 50 is offered with the 90kW unit as the entry-level engine, and the 130kW version as a higher power option. The Crafter CR50 has dual wheels on the driven rear axle with its gvw up to five tonnes, with the Crafter CR55 (5.5-tonne gvw) joining the range next year. All front-wheel drive Crafters, perhaps unsurprisingly, have a transverse engine. The maximum trailer load for the front- wheel drive models is 3,000 kg. The front-wheel drive Crafters offer the lowest load sill, the lowest entry step height and the highest cargo space. The front-wheel drive models are available as the Crafter CR30 and CR35 with a medium wheelbase of 3.6m and a total length of 5.9m (L3) in combination with a normal roof (L3H2: 2.3m) or high roof (L3H3: 2.6m). The cargo capacity of the Crafter L3H2 is 9.9 cu m, while the L3H3 is 11.3 cu m.
The FWD Crafter 35 can also be configured with the long wheelbase of 4.49m, total length of 6.8m (L4), and high roof (L4H3: 2.6m) or with the extra long wheelbase with extended overhang at the back and a total length of 7.4m. It can feature the high roof (L5H3: 2.7m) or with the extra high roof (L5H4: 2.9m). The cargo capacity of the Crafter L4H3 is 14.4 cu m, while the L5H3 is 16.4 cu m.
With the super high roof this figure goes up to 18.4 cu m – the maximum cargo capacity of any Crafter. The 4Motion all-wheel drive Crafter also has a transverse engine. A multi-plate clutch (Haldex coupling) distributes engine torque to all four wheels as required. Its 4Motion provides more security and traction than other drive variants, with the all-wheel drive system operating together with other control systems such as electronic stability control (ESC), traction control (ASR) and the electronic differential system (EDS). The 4Motion versions are aimed at businesses that frequently use the vehicle on the rough terrain such as construction sites, in poor weather conditions or, in remote areas lacking paved roads. Crafter 4Motion variants are offered in 103kW and 130kW engine versions, the latter with an automatic option. The rear-wheel drive Crafter’s engine is mounted longitudinally, and is aimed at businesses that use commercial vehicles towing loads of more than 3,000kg or requiring a gross vehicle weight rating of more than 3.5 tonnes. It offers improved traction over the FWD versions when carrying heavy loads (with gvw of up to five tonnes) and uses the 90kW unit as the base engine. The RWD Crafter with single rear wheels and a manual gearbox is also available in the 103kW versionand is offered with an optional automatic gearbox. The RWD Crafter’s base configuration is medium length wheelbase and normal (L3H2) or high roof (L3H3). The cargo capacities are respectively 9.3 cu m (L3H2) and 10.7 cu m (L3H3). The automatic transmission is new for the 2018 model year Crafter. 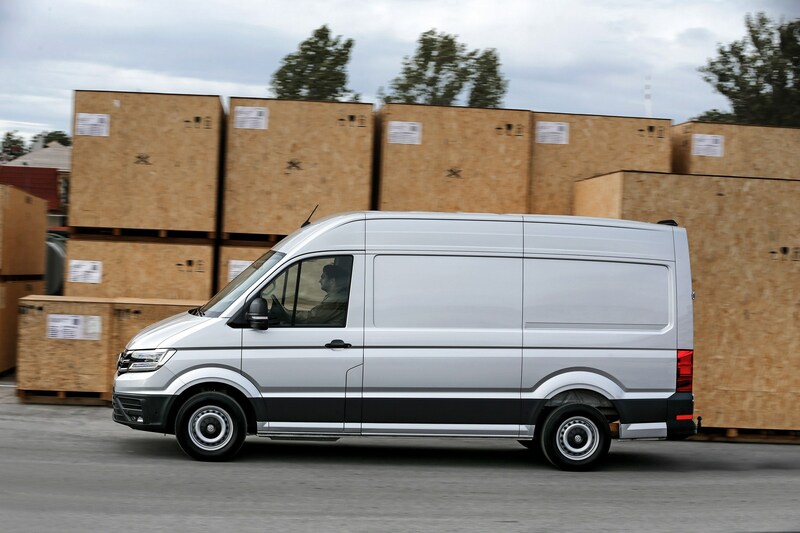 It’s the first time an eight-speed auto has been offered in a large van, and is a feature increasingly in demand according to van operators. It will be offered in a range of engine and drive variants in 2018. The transmission is shared with the Volkswagen Amarok pick-up truck, and supplied by ZF. It replaces the six-speed Shiftmatic option in the previous Crafter, which was an electronic shifting manual rather than a true automatic, and as a smoother shift and shouldn’t be much more expensive on fuel than the standard six-speed manual. Van operators are increasingly looking to automatic transmissions, despite the cost of the option, as they can reduce the risk of driver fatigue. Also, where a manual van’s clutch might be short lived if the vehicle works mainly in urban areas, the auto’s extra cost can be partially offset against clutch replacements during the van’s lifecycle. The Crafter is certainly an improved drive with the automatic transmission, and it really is less obtrusive having a conventional torque converter automatic than an electronic sequential manual. There’s no distraction through disjointed feeling upshifts – the eight-speed auto just feels so sophisticated you just forget it’s there. The cabin offers a good working environment, with high-quality fittings and excellent comfort on long journeys. Crafter drivers benefit from a wide range of safety and assistance systems, many of which are standard, including ESC, ASR and EDS, crosswind compensation, crosswind assistance on closed body vans, multi collision braking to help prevent further crashes after an initial impact and hill start assist. Optional features, dependent on the specification, include the following: hill descent assistance (for 4Motion), side wall protection, parking assistance (with automatic steering), trailer assistance, adaptive cruise control, speed limiter, road sign monitoring, a light assistance system, collision mitigation alert and braking, lane-keeping assistant, blindspot warning, rear cross traffic alert, driver attention alert and tyre pressure monitoring. The second-generation Crafter is the complete package – its predecessor never was. The additions for the 2018 model year makes it more likely Volkswagen will have a suitable derivative for your business, no matter how specialised it is or how hard the van will have to work. In most areas, it’s equal or close to the benchmarks set by rivals, and has a golden opportunity to gain ground over others as a heavy-duty van before the new Mercedes-Benz Sprinter arrives.